It is not always possible or allowed to tackle the sources of local QRM. What remains is trying to reduce the noise level by means of your antenna system. Every action you do, ask your self what happens to the signal and what happens to the noise. The best location for a receiving antenna is the location with the highest signal to noise ratio. In most cases this is as far away as possible from potential noise sources. Also the height can make a difference. The signal to noise ratio not necessarily stays the same when changing height. The noise is radiated locally and is received by the antenna at a different elevation and azimuth angle. Most important is avoiding any coupling with other antennas, feeders, poles, etc., etc. You don’t want feeders to be a part of your antenna system. On their way to the shack and in the shack they can pick up all kind of noise sources. So your receiving antenna needs to be perfectly balanced. Coupling with other antennas and object is mainly handled by distance. In a small city lot distance is limited, but never negligible. Antenna A (short capacitive active antenna) is an example of an unbalanced receiving antenna. The feeding coax cable is an unwanted functional part of the antenna. Antennas B and C are good examples of balanced antennas. A magnetic loop has mainly a magnetic near field and is told to be insensible to local QRM for that reason. Near field properties are only relevant when the noise sources are in the near field (<l/6). Even on 80 meters most sources are not in the near field and/or the loop is not in the near field of the source. The noise source itself is in most cases electrical wiring. Because of the dimensions the radiated field can be magnetic (H) as well as electric (E). And at distances between 0.1l and l the magnetic loop turns out to be even more sensitive to the electric (E) field [W8JI]. So only on 160mtr and longer wavelength the magnetic loop may have an advantage over a short dipole. This is a very effective way of reducing noise. Not only local noise, but all noise. 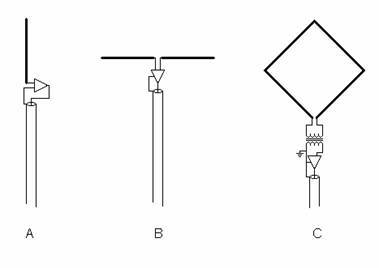 At first we think of beams, beverages, rhombic or EWE/K9AY terminated loops antennas. But because of their size they can not be used in a small garden. The small magnetic loop and the short horizontal dipole both have a figure 8 shaped radiation pattern. Perpendicular to the loop for example we see a null in the pattern that can be used for nulling out a local QRM source. So for a city lot the small magnetic loop or the short horizontal dipole is the way to go. Only when the local noise source is on a more distant location, the groundwave is responsible for the incoming signal. The groundwave is mainly vertically polarised. Then horizontal polarised antennas like the horizontal (short) dipole or horizontal magnetic loop (Alford/K6STI) have an advantage. Polarization mismatch is one of the mechanisms causing fading (QSB). The signal to noise ratio can be improved by keeping up the signal strength and removing the fading. The turnstile is an example of an circular polarised antenna. But circular polarization is also possible with two perpendicular loops fed 90 degrees out of phase. Placing two antennas with different polarization on a certain distance to each other makes diversity reception possible. Fading by multipath reception or by polarization mismatch works out different for the two antennas. Using two identical and synchronised receivers gives you always the strongest signal. Alternatively you can use only one receiver and switch between the two antennas by hand. Noise cancelling is a very effective way of eliminating a single noise source. You need two separate antennas. The noise source is eliminated by combining (adding) the signals of both antennas with the matching phase difference and amplitude ratio. Assuming both antennas are receiving the noise source. When one of the antennas doesn’t receive the noise source, noise cancelling is not needed of course and only that antenna can be used. In principle by adding more antennas more sources can be cancelled. We can make an array with two (or more) antennas with identical radiation patterns placed on an certain distance to each other. The phase difference and amplitude ratios of the antenna signals when combined (added) define the overall radiation pattern of the array. The effect is directivity with the advantage that it is electronically controlled.